I started reading Summer of Sloane while out running errands when I needed something to pass the time. I had no intention of being sucked into this read, but that was exactly what happened and I was left wishing I had read this book sooner. I was hooked from the beginning. The book starts with Sloane finding out that her best friend is pregnant with Sloane’s boyfriend’s baby. When the boyfriend tries to confront Sloane, she punches him in the face, which breaks both his nose and her hand. Her life in shambles, Sloane and her twin brother, Penn, jet off to spend the summer in Hawaii with their mom and step dad. There she reconnects with old friends as well as makes new ones, but the drama she left back in Seattle isn’t going away anytime soon and Sloane will have to face it sooner or later. I loved Sloane the moment she punched Tyler in the face. The guy needed it, and I’m so glad that that was her reaction. Losing your best friend and your boyfriend (two people you’ve known for practically your entire life) in one fell swoop is no easy matter, and my heart broke for Sloane. I thought that her actions and decisions she made throughout the book were very justifiable — she was the one who was betrayed, so she is the one who gets to feel hurt. Erin L. Schneider’s writing is addictive, and I couldn’t help but fly through Summer of Sloane — I just didn’t want to put the book down! I loved the tropical Hawaiian setting, main plot, and all the minor characters. The drama kept me engaged, but a couple misunderstandings toward the end frustrated me. However, I did love the ending where Sloane finally learned to make decisions for herself. 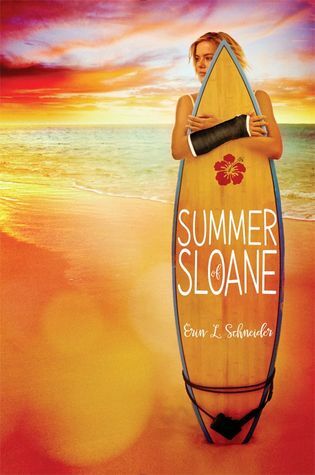 Overall, I really enjoyed Summer of Sloane and I look forward to reading Erin L. Schneider’s next book. I highly recommend Summer of Sloane to contemporary lovers looking for a great read filled with summer vibes.